If you remember this sound, I'll tell you that I was listening to Youssou Ndour while hacking some Lua on my computer, and was listening to this track, And heard that familiar sound that made me alt-tab to some messaging application (which I don't have anymore). The muscle memory reaction made me find which was the app, and yes, it's damn msn. So here there are the 4 books I recently got that are keeping me *very* entertained. 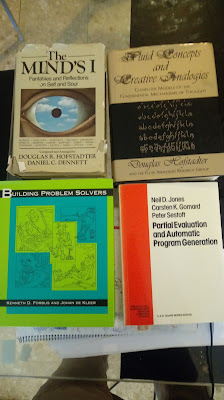 Two of them are Lisp-related, and two of them are Hofstadter's. The minds I : Short stories from Hofstadter, Dennet, and other sci-fi authors and thinkers. I discovered Stanislaw Lem (author of the story 'The Congress' is inspired on). The whole book is mindblowing. 75% read so far. Fluid Concepts and Creative Analogies. Another Hofstadter's book. It goes deep in his view of what AI means, and the different phases where a human brain is creating something from nothing. Example: The sense of 50*10 being "easier" than 74*18: which are the reasons why we find that happening? Can we make machines think in that way also? Is it worth it? 40% read so far. 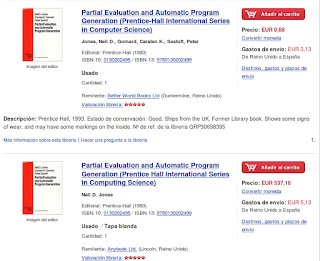 Partial Evaluation and Automatic Program Generation: I've been wanting to read that book for ages, and it's free in pdf. 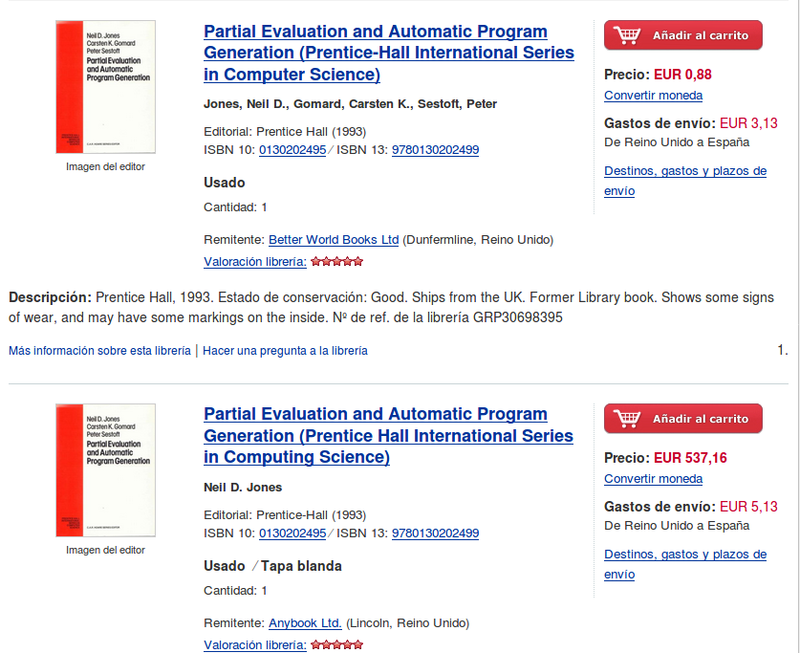 The phisical copies are astronomically expensive, but I was lucky enough that my book bot found a copy for 3 euros :). It uses crazy techniques to turn interpreters into compiler generators. Futamura projections are totally mindbending. 20% read so far. Building Problem Solvers: A Lisp book on problem solvers. I discovered this techniques in Norvig's PAIP, and also CTM has some parts of Constraint Programming, and I thought that was pretty cool and broad, so I got that one also. The book is written in "pre-common" Lisp, so no CLOS, and *lots* of mutable state, setf-ing function arguments and the like. I'm just starting it, but I think it will be more valuable method-wise than code-wise.